Wow, what a great turn out last week ENVI and E3De – Learn the Latest! webinar! I am always happy to hear your questions, see how you’re using our software, and share our latest and greatest updates with you. This week, I’ll explain how the latest version of ENVI integrates even more with Esri’s ArcMap, by supporting image services and mosaic datasets. Now, all of the imagery data available through Esri image services and mosaic datasets can be used in ENVI. You can search for additional data sets to conduct change detection analysis, include new information for building footprints and parcel information, add other modalities of data for data fusion analysis, and add city base maps to give your image analysis results greater contextual and situational awareness. During the webinar, there were some questions about how to open image services in ENVI. 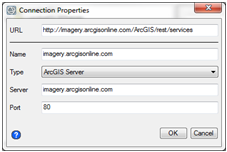 When you access a published Esri image service from ENVI, you do it by using the Open Remote Dataset dialog and you enter a URL, such as this one here for ArcGIS imagery online: http://imagery.arcgisonline.com/ArcGIS/rest/services, and then ENVI will connect to that image service. With the tight integration between ENVI and ArcGIS, you can easily export results into ArcMap, create map packages, and create map products. ENVI uses the same print layout view as ArcMap, so all you need to do is apply an existing template file, or an .mxt or .mxd, and then you’ll be ready to print from ENVI as well. There are many ways that ENVI and ArcMap are integrated, and I’ve just touched on a couple of them here. How do you take advantage of the ENVI and ArcMap integration? 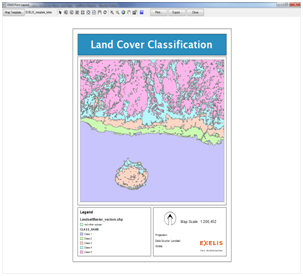 Do you plan to take advantage of the Esri image services access in ENVI? Distributed Geospatial Services. This time it’s for real.